Multi-functional Lazy Sofa is becoming a popular trend for people to enjoy themselves after their tiring work every day. The MOST impressive highlight of this lazy sofa is the easy transformation from a Normal Floor Sofa to a Comfortable Sleepy Bed. Different levels can be adjusted to meet your favorite posture needs and each level will serve you a specific feeling when seating in. It is great for almost every place, such as living room, bedroom, home office, dorm room, balcony and outdoor space, and suitable for watching TV, play games, working on a laptop or take a nap in it. You won't be disappointed with this purchase. * Lay down dimensions: L55" x W28" x H6.3"
* Stand up dimensions: L33" x W28" x H28"
* Seat dimensions: W19" x L22"
* Items may slightly differ from photo in terms of color due to the lighting during photo shooting or your monitor's display. Perfect for living room, bedroom, dorm room, balcony, game room and outdoor space, etc. 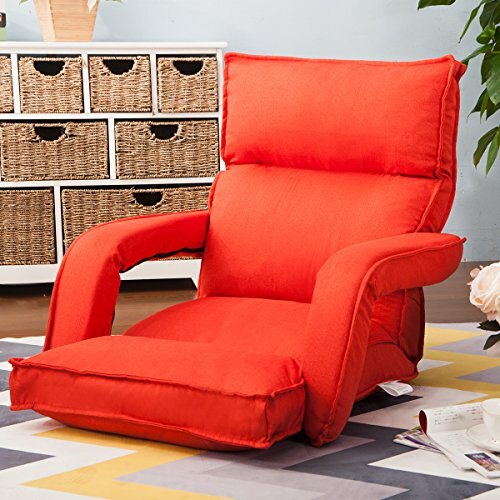 Perfect for floor use, playing games, watching TV, reading a book or taking a nap for a while. Black Soft Fabric Material,Comfortable and easy-to-clean. 5 levels for adjustment both on the Head Place and Waist, armrest is flexible accordingly.